1. Fill five glasses with 3 TBSP water each. Use warm water if you can. 3. As soon as the shell on the red Skittle dissolves, take the Skittle out of the colored water. 4. 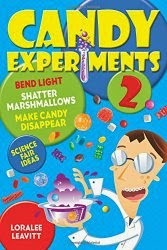 Check your other solutions to make sure the candy has dissolved. (The ones with the most Skittles will take the longest to dissolve.) If it's time to do the rainbow and one of your solutions isn't ready, start with the next color of the rainbow. 5. Pour your rainbow with the purple on the bottom and the red on the top. The Density Rainbow is tricky, and can be ruined if you pour too fast or if somebody jostles your elbow. In case this happens, prepare a second set of solutions. Since you'll have lots of reds and oranges left over, but not a lot of purple, use the Skittles in reverse order (20 red/15 orange/10 yellow/5 green/1 purple). Pour your rainbow as above.